Hemorrhagic brain metastasis from hepatoblastoma is an extremely rare occurrence with only few such reported cases. 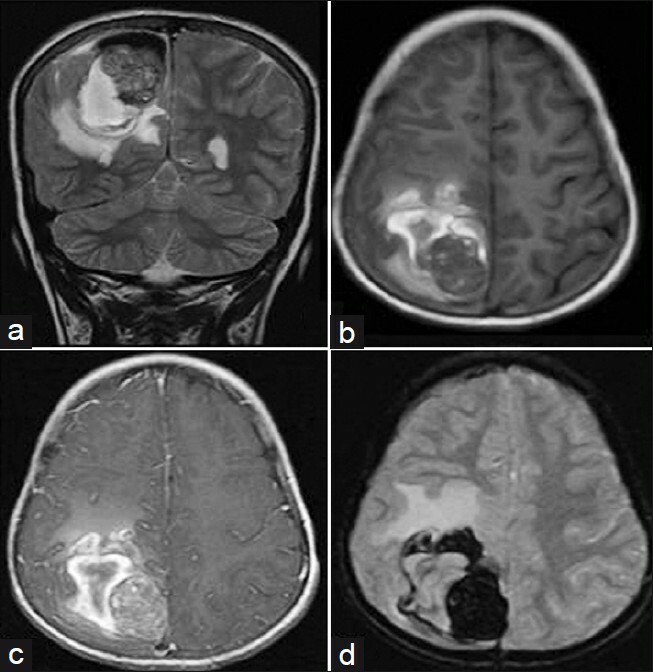 This case report is of a young girl who presented with headache and vomiting secondary to hemorrhagic metastases in right parietal neuroparenchyma, detected on Magnetic resonance imaging (MRI). A 9-year-old girl presented with headache, irritability, and decreased appetite since 2-3 weeks and vomiting since 2-3 days. She had previous history of hepatoblastoma diagnosed 2 years earlier which was confirmed by a Computed tomography (CT)-guided biopsy. At that time, four cycles of preoperative chemotherapy consisting of cisplatin, 5-fluorouracil, and vincristine were administered and tumor resection was done. It was followed by final two cycles of chemotherapy. The patient apparently remained stable for the following 2 years, until present symptoms developed. However in the intervening period, she did not undergo follow-up in spite of the physician's advice. At presentation, her ophthalmologic examination revealed bilateral papilledema. The neurological examination of the child did not reveal any abnormality. However, due to persistence of her symptoms, MRI brain was performed. It revealed a large heterogeneous mass lesion with extensive perilesional edema in right parietal parenchyma. Its superior portion had a well-defined rounded component which was isointense on T1 [Figure 1]b- and T2 [Figure 1]a-weighted images with focal hyperintense areas within. It revealed mild enhancement on intravenous administration of Gadolinium-DTPA [Figure 1]c.The anteroinferior portion of lesion was hyperintense on both T1 [Figure 1]b and T2 [Figure 1]a weighted images, suggestive of late subacute hemorrhage (extracellular methhaemoglobin). The most superior portion of lesion was hypointense on T2 [Figure 1]a and isointense on T1 [Figure 1]b weighted images, suggestive of acute hemorrhage (deoxyhemoglobin). These areas were hypointense on gradient echo images [Figure 1]d. In view of hemorrhages of different ages and enhancing component, the possibility of hemorrhagic metastasis from hepatoblastoma was considered. After 2 weeks, chemotherapy was started. Two cycles of chemotherapy were given one after another and third cycle was given after 21 days. It consisted of cisplatin, 5-fluorouracil, and vincristine. Meanwhile, whole-body PET scan was performed which revealed moderate sized mass in the left lung. No PET scan had been done during initial 2 years. However, a chest radiograph was taken which was normal. 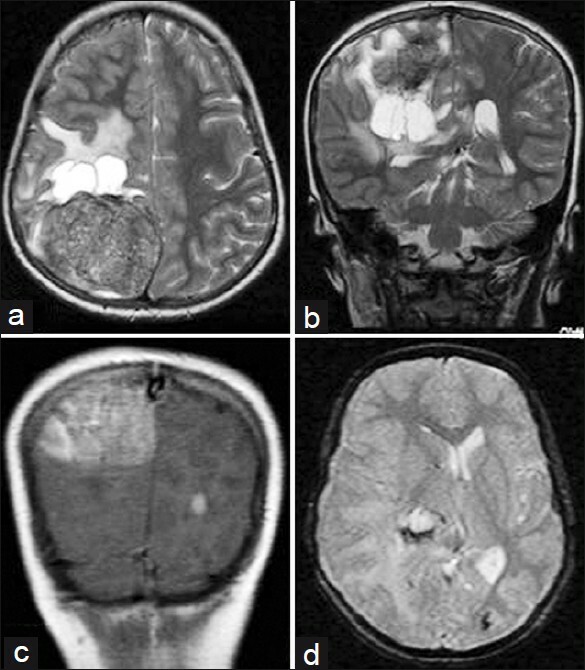 A follow-up MRI brain done after 2 months, revealed an increase in the size of the solid enhancing component of this lesion [Figure 2]a-c along with transtentorial herniation and midline shift to the left [Figure 2]b. In addition, a new small hemorrhagic enhancing lesion was seen in left occipital parenchyma [Figure 2]c and d. At this point, the patient's serum alpha-feto protein level was 24,363 ng/ml. All these findings confirmed the diagnosis of recurrent hepatoblastoma with brain and lung metastasis. The child's parents did not give consent for resection of the brain lesion. The patient has now been started on chemotherapy and has completed three cycles. Her general condition has improved significantly with symptomatic relief as her recurrent episodes of vomiting had subsided and she was accepting oral feeds. However, no documentation of decrease in the size of the lesion could be made as patient was again lost to follow-up. However, unfortunately, when we called the relatives now for asking about her present status, they informed us that she had died and denied to provide us further details. Figure 2: Follow-up Magnetic resonance imaging (MRI). Axial T2W (a), coronal T2W (b), coronal post-contrast T1W (c) and axial gradient echo (d) images demonstrate a significant increase in the size of the lesion in the right parietal parenchyma and a new lesion in the left occipital parenchyma. Metastases at diagnosis occur in 10-20% of patients. A chest CT is an important aspect of the workup because the lung parenchyma is the most common distant site for metastasis. , Other sites of distant metastases, including brain and bone, are rare and usually occur in the setting of relapsed disease. Lung metastasis identified on diagnosis is one of the most reliable prognostic indicators of an unfavorable outcome for patients diagnosed with hepatoblastoma. The prognosis for children with hepatoblastoma with distant metastasis is poor at diagnosis and even worse with relapse. In cases with multiple site metastases, surgical treatment of pulmonary lesions has not been effective. The age distribution of reported cases spanned from the newborn period to 10 years of age. The number of brain metastases did not seem to affect the outcome. A case of an 18-month-old female child, who presented with vomiting and altered sensorium, 6 months after hepatectomy, has also been reported. This patient had not received postoperative chemotherapy and complete autopsy examination revealed multiple lung metastases and a large hemorrhagic metastasis in the left parieto-occipital lobe. Although our patient was symptom free for 2 years, lack of regular follow-up and monitoring of the serum alpha-feto protein level appears to be contributory toward failure to detect metastases in the asymptomatic period. Hence, regular postoperative follow-up, monitoring of the serum alpha-feto protein level, and high index of clinical suspicion to get MRI imaging done at the earliest appears to be the only way to detect brain metastasis early. However, routine MRI brain screening is not recommended due to cost and rare occurrence of brain metastasis in the case of hepatoblastoma. 1. Litten JB, Tomlinson GE. Liver tumors in children. Oncologist 2008;13:812-20. 2. Herzog CE, Andrassy RJ, Eftekhari F. Childhood cancers: Hepatoblastoma. Oncologist 2000;5:445-53. 3. Brown J, Perilongo G, Shafford E, Kneeling J, Pritchard J, Brock P, et al. Pretreatment prognostic factors for children with hepatoblastoma-results from the International Society of Paediatric Oncology(SIOP) Study SIOPEL 1. Eur J Cancer 2000;36:1418-25. 4. Park SM, Choe BK. A case of recurrent hepatoblastoma: Lung, heart and brain metastasis. Korean J Pediatr 2006;49:691-5. 5. Begemann M, Trippett TM, Lis E, Antunes NL. Brain metastases in hepatoblastoma. Pediatr Neurol 2004;30:295-7. 6. Nagle SB, Deolekar MV, Dhamnaskar P. Hepatoblastoma with complete regeneration of liver and with metastasis to lungs and brain within six months after partial hepatectomy-a case report. Indian J Pathol Microbiol 1996;39:147-9.